The old Pharaoh Tamose lies mortally wounded. The ancient city of Luxor is surrounded. Taita, ex-slave and general of Tamose’s armies, leads his men to victory against Egypt’s enemies. But upon his victorious return to Luxor, he is seized as a traitor. Tamose is dead and a new Pharaoh has risen. Pharaoh Utteric is young and cruel, and threatened by Taita’s influence within the palace – especially his friendship with Utteric’s younger and worthier brother, Rameses. Rameses is torn between duty to his family and loyalty to his friends. Yet he knows that there is no choice. Taita must be set free, Utteric must be stopped and Egypt must be reclaimed. Although I would rather have swallowed my own sword than openly admit it, deep in my heart I knew that it was finally over. Then I remembered that his mother had also been mad - only her madness merely took the form of sexual incontinence. SOURCE ... A Christmas present from Mr T.
MY THOUGHTS ... Its no big secret, this author's books usually garner something of a lukewarm reception from me but I like this, his 'Egypt' series, so much that the books have gained a permanent home on our shelves. After the somewhat disappointing Desert God; the author having seemingly ironed out all of the things I so disliked about it - namely the lack of OR OTT attention to detail, the military manoeuvres that seemed to go on and on and on, the poorly written and ill considered secondary characters - Pharaoh seems to have got the series back on track though nothing so far has surpassed the first book, River God. What has in some ways become one of my 'guilty pleasure' reads. Yes, I know some (OK, most) of the characters are/have become caricatures; that the lead character, Taita gets under my skin in a way few characters do (and not in a good way). And, yes, I'm aware that any attempt at historical accuracy is seemingly very much a secondary consideration (and increasingly so); that the inclusion of myths and legends and what I guess could be termed the 'supernatural' (whilst I personally enjoy the inclusion) are a big no-no in the minds of many of the series' readers and yet there is just something about these books that keep me wanting more ... until perhaps now. Egypt is a place I'd love to go but in lieu of traveling I love visiting via books. I'm intrigued by your thoughts on this book/series. Thanks for sharing! Greetings Tracy. 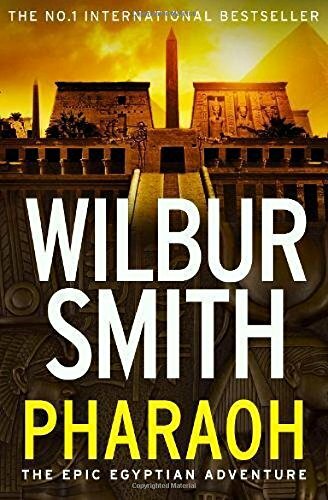 I didn't know Wilbur Smith wrote about Egypt! I've read some of his novels depicting Africa and its wildlife years ago. I'm intrigued. Blessings. Love love, Andrew. That's a long time to be running a series. Maybe you're right–time for him to try something new. This series sounds like it might be fun to read. In terms of historical accuracy, I could care less if a book like this deviated in a major way. I am fine with getting my history from history books and entertainment from books like this. Glad you enjoyed this one. Guilty book pleasures are a good thing. :) I haven't read any of these books- but have enjoyed your reviews and am curious about them. What few novels I've read that take place in Egypt, I've certainly enjoyed. (many of those during Roman times) I'm not convinced about these, though. It always throws me off when an author writes stories out of order chronologically. I might have missed you saying, but have you read the three that follow this one? Also... I really do prefer historical accuracy, when possible. Those are some interesting snippets you shared. This sounds like a good series and I like the setting but I know what you mean, sometimes the series needs to end while it's still ahead. Tracy, I always appreciate your writing as well as your honesty. Thanks once again! I might give this series a try, someday.